Angel Number 48, by appearing frequently in your life, indicates that the guardian angels are signaling to you that a sequence of events is facing a closure shortly. It is also a message that you will be amply compensated for all the honest efforts you have put in. The termination of the succession of events will open up a plethora of fresh openings and prospects in life. There is no need for any apprehension about material loss. The angel number 48 will present you with prosperity and affluence in all the aspects of your life for your accomplishments. You should be grateful to the angel numbers for their grace and rewards. Angel number 48 meaning comprises of the qualities and energies of Number 4 and Number 8. Number 4 represents the characteristics of common sense and sincere efforts, strong will power and meticulousness, practicality and accomplishing positive outcomes, integrity and genuineness. The additional traits of Number 4 are establishing a strong base for self and others, enthusiasm and forcefulness while working on your goals and sensible principles. Number 8 principally deals with Karma encompassing the collective principles of action and response, philanthropy and acceptance for a social cause, inherent skills and talents, and realization of riches and prosperity in life. Becoming wiser from occurrences in life, independence and reliability are the other vibrations of Number 8. 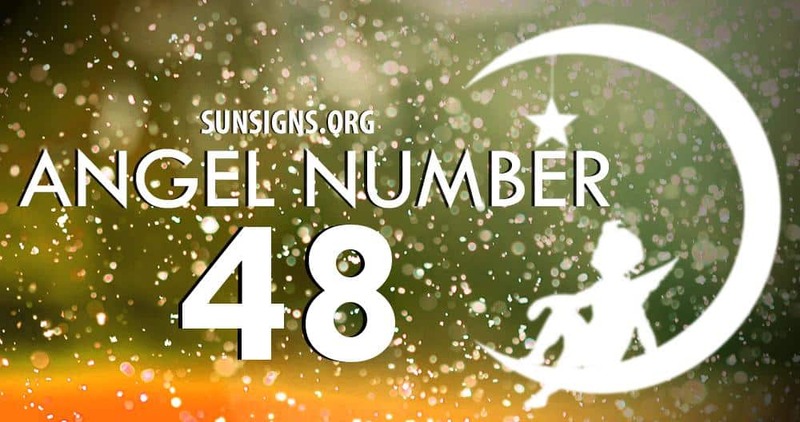 Angel Number 48 symbol is a communication from the angels that they are by your side as your life is changing for the better with the new transformations in life, and you will be gifted with wealth and riches. These will take care of all your financial and material requirements and you can handle the new changes in life without any anxiety. Angel Number 48 is a message from the angels that by putting in lot of effort and working with strong will power, you are leading a life based on your personal beliefs. In this course of action, your objectives are in line with the divine intentions and the real rationale for existence. You will be blessed with copious benefits and rewards which will allow you to focus on the true objectives of life. In this journey you have the complete help, encouragement and supervision of your birth angels.